DIGESTIVE ENZYMES AND PROBIOTICS: Support gut health and your digestive tract with 5 billion probiotics, plant-based enzymes, and a prebiotic to strengthen the microbiome. COMPLETE NUTRITION FOR YOUR BODY: Feel the power of organic, gluten-free and clean greens that work to support your immune system and health. STRENGTHEN YOUR IMMUNE HEALTH: Optimal levels of organic Vitamin D (2,000 IUs a day) helps support bone health and your overall immunity. SIMPLE VEGAN HEALTH: Supergreens +D makes it easy to maintain a vegan, plant-based lifestyle with added plant-based digestive enzymes to optimize digestion. Time to feel like the superhero you are… and that takes greens… lots of them. Still, it’s hard to fit in multiple servings of broccoli, gluten-free barley grass and spinach every day. Supergreens +D makes it easy. It all adds up to an immunity and digestion boost for a healthy and active life. And with three little capsules per serving, these greens are easy to swallow. The sunshine vitamin is vital for immune and bone health. We provide 2,000 IUs from organic mushrooms with beneficial beta-glucans. Unlike other supplements, which source vitamin D from lamb’s wool (ugh). No artificial vitamins here. Organic mushrooms provide B vitamins, and organic greens serve up natural vitamins and minerals, including folate. Broccoli gives your colon health a boost with protective sulforaphane, while inulin from Jerusalem artichoke feeds all the good bacteria in your gut. We include a broad spectrum of probiotics (over 5 billion per serving!) so your gut is replenished with beneficial bacteria for a happy tummy, and a prebiotic (inulin) to support the growth of healthy bacteria. In addition to the native enzymes inside, we add extra plant-based enzymes that encourage digestion (no discomfort) and enhance nutrient absorption. Chlorophyll-rich organic plants like parsley, barley grass, spinach and broccoli help bind to and remove toxins from the digestive system. Green leafy veggies are just what the doctor ordered. Nutrient-dense greens are packed with hundreds of health-promoting compounds. All ingredients are harvested at the peak of nutrition, and cold-processed to capture all of earth’s bounty. Supergreens +D makes it easy to get your greens. 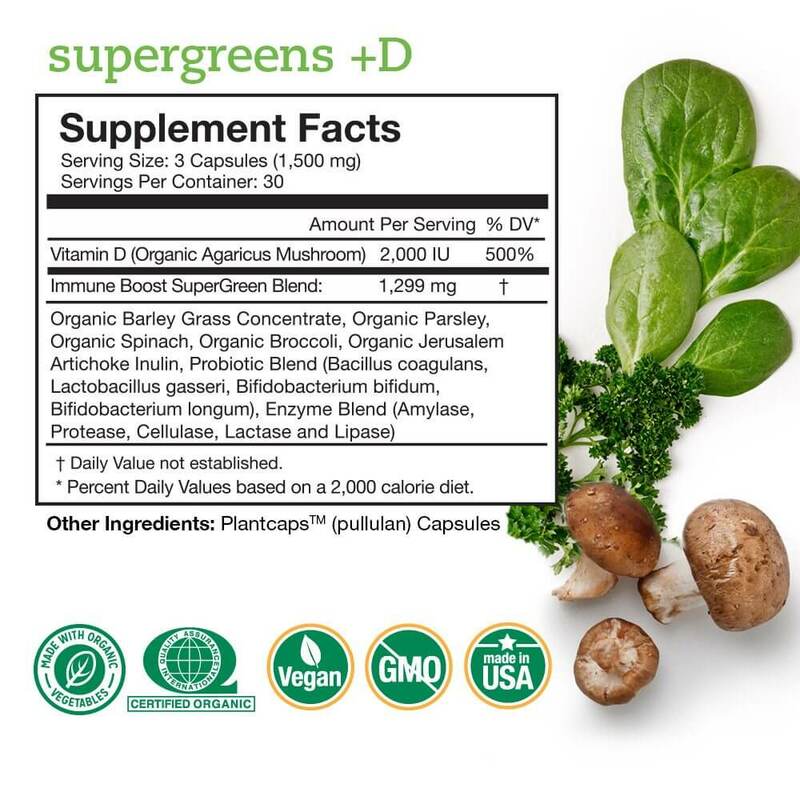 Supergreens +D is notable for what’s inside and for what’s not. No fillers, no synthetics, no chemical isolates. Simply none of the yucky stuff you’ll find in most other brands. It’s a great way to get what your body craves for health, at far less cost than if you were trying to buy and juice these foods by yourself (and no clean up! ).